There is a pretty small window of opportunity when it comes to enjoying a freshly cut Christmas tree. 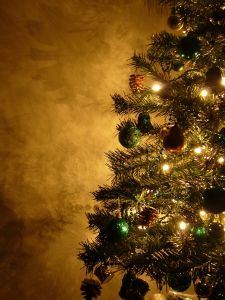 Typically, most trees are first sold during Thanksgiving weekend and right up to Christmas Eve. The longer you wait to buy the tree, the longer you’ll get to enjoy it but where’s the fun in that if it has to come down right after New Years? The key is not to let your Christmas tree over stay its “welcome.” You can stretch out your time with the tree by making sure you water it every day. It should be in a stand that can hold at least a gallon of water. If you missed out on that, think ahead to next year. The moment a tree has dried out is when it should come down. This doesn’t always mean it turns brown but when the needles start falling off in record numbers then it’s time to get rid of that tree. While there might be an opportunity to toss out the tree on your curb and have it picked up by the municipal workers, you have to make sure you get it out on the scheduled day. It’s different for each neighborhood. If you opt to get rid of your tree that way, you’ll be forced to do it on their schedule and not yours. Miss the pick-up and you’re stuck with the tree. Even if it is out of your home, it’s still a fire hazard. One missed tossed cigarette and that tree will go up in a flash. You best bet is to hire Junk King Colorado Springs to help you dispose of that tree properly. Working with Junk King, the junk removal specialist of Colorado Springs, means you’ll be working on your schedule. In other words, when you’re ready, Junk King will be standing by. Knowing that Junk King will be coming by to pick up your Christmas tree after the holiday can also mean you’ll be able to get rid of any other bulky items that have piled up. If you’ve gotten a new big screen TV then you’re going to have a big box to toss out. If you’re replacing the kids’ bikes with new models then the old ones should be taken away. There could also be a whole bunch of electronic gadgets that have becoming obsolete along with several appliances. All of those things can be picked up at the same time as your tree and all taken away on the back of the Junk King truck. Make your appointment with Junk King for your post holiday clean up today. That will be one less thing you’ll have to worry about! This entry was posted in Christmas Tree Disposal, Colorado Junk Recycling, Colorado Recycling, Colorado Springs Junk Removal, Junk King Colorado Springs, Junk Removal Colorado Springs and tagged CO junk removal, CO tree disposal, Colorado Springs Christmas Tree Disposal, Get rid of xmas tree CO on December 20, 2012 by John Busby. Last updated August 2, 2017 .